I read this on a face book post this morning published by Diabetes Insight and it really struck a cord with me. I Met with a client today who I had assessed previously suffering from a range of gastrointestinal issues triggered by excessive usage of artifical sweeteners. Glad to say symptoms all resolved from stopping sweeteners and blood sugar levels are v, #Sugery good. My own experience of this started after i was first diagnosed with Type 1 Diabetes. On diagnosis I was told from there on in, it was to be Sugar Free, and Diet drinks to be consumed. Like any good Diabetic I took myself off to the local supermarket to buy the supplies I would now need as a person living with diabetes. Diet Coke, 7up, club orange, yogerts, sugar free foods were also on the list and before long I was stocking the shelves of my kitchen with everything I would need to live a healthier & diabetes lifestyle. I felt quite proud of myself as I embraced my new lifestyle with enthusiasm and thought what a good diabetic I was. I got myself to my GPs office to talk about this worsening problem, and after sitting in the waiting room for over a half hour I was unable to get up and walk to the consulting room, on a positive note I now didnt have to explain myself and try to convince her of the severity of the problem I was having. my other issue was my memory, if I did'nt pop an appointment in my iphone with a reminder alarm it just did'nt happen. I got into a habit of writing everything down. Things I knew how to do, were gone from my head and I struggled to complete tasks in a work environment. My other issue was tummy and bowel problems which resulted in many colonoscopy's, this was'nt nice and yielded no result. 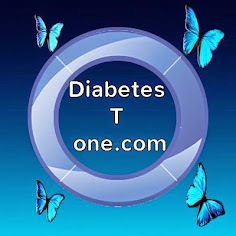 I just couldnt believe how downhill I had gone within the first year of a diabetes diagnosis. at this rate id be in a wheel chair not knowing where I was long before I ever got to the age of 60. things were not looking good. It was my GPs idea that I have and MRI, MS was what she was checking for, and things were looking very bleek. The MRI scan came back clear other than a few very small leisons, considering my age and pre-existing medical conditions it was ok the doctor said. The MRI scan was repeated a year later with the same result. Frustrated with no reason for how I was feeling I started doing some research "googling" triggered by a post I came across on face book, putting 2 & 2 together I started to make some changes to my diet. Now it is very difficult to avoid asparthame altogether, it seems to be in everything we eat. I substituted me drinks for water flavoured with pieces of fruit, I bought natural yogurt and added fruit to it to flavour and sweeten it. I checked the labels of everything, and if i did'nt like what I was reading I put it back on the shelf and found an alternative to what I needed. literally within about 6 weeks, I had no stiffness in my joints, I could walk to the shop daily, getting out of bed was no longer an ordeal, and yes I could pick something off the floor and get back up. My memory improved a great deal but not totally but at least I could remember what I had gone to another room for now. 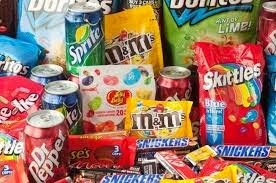 I know when we are diagnosed, we start a life of avoiding sugar / glucose but making that switch to diet drinks and foods, sugar free products and the sachets of sweeteners for tea and coffee but this my friends is not something you should do without knowledge of the dangers and problems we face when consuming these products daily. I now use stevia if I do need a sweetener but most times I just do without. health food shops can help with alternatives and there is lots of information about natural safe alternatives on the internet once your prepared to do the research. 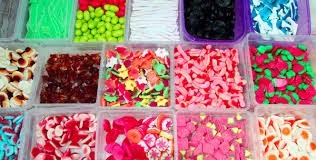 Those sour jellies that make children squirm, but they eat them. All of these foods - treats - snacks, should be setting off alarm bells in the heads of those buying, eating and supplying these to children. There is no substitute for healthy unprocessed foods. Iv come across some seriously dilusional people that wont eat fruit because they have diabetes, they miss the vitamins and nutrients fruit will provide, yet they will consume vast amounts of sugar free products that are slowly creeping up on them when they are not looking, to cause them so many health issues they have'nt even thought of yet. Don't let these large companies fool you. 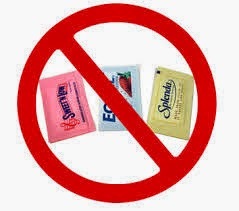 There is no magic alternative to sugar when it comes to sweeteners. 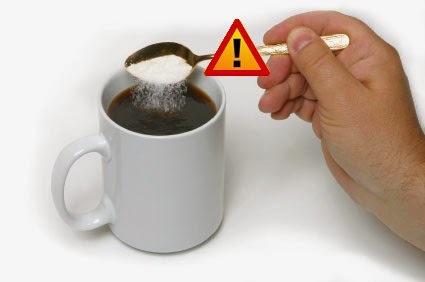 There are reports from all over the world from people who report being harmed by sucralose. 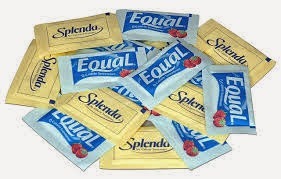 At the time of my last analysis in 2006, there were only six human trials published on Splenda (sucralose). Of these six trials, only two of the trials were completed and published before the FDA approved sucralose for human consumption. The two published trials had a grand total of 36 total human subjects. 36 people sure doesn't sound like many, but wait, it gets worse, only 23 total were actually given sucralose for testing and here is the real killer: The longest trial at this time had lasted only four days and looked at sucralose in relation to tooth decay, not human tolerance. And that’s not all. When you look at effects, there isn’t much of a difference between the two sweeteners. Headaches…blurred vision…short-term dizziness. Splenda even causes depression and weight gain. This “healthy” sweetener wrecks your digestive system too… It kills off healthy bacteria in the stomach. The good bacteria fights off harmful invaders and helps prevent irritable bowel syndrome or other stomach disorders. Now, a new study has revealed much more about the so-called “healthy” sugar alternative. And it’s worse than we thought.